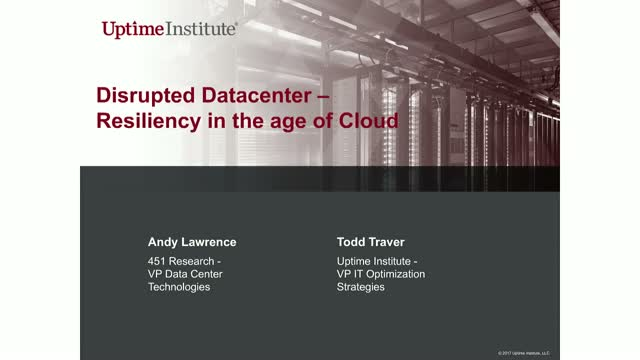 Join Todd Traver, VP IT Optimization and Strategy at Uptime Institute and Andy Lawrence, VP Research, Data Center Technologies at 451 Research for a discussion on the opportunities, benefits and challenges to successful implementation of a resilient multi-site workload solution. The evolution of compute from single-site data centers with proven in-house engineering to a multi-site hybrid computing model is enabling distributed models of resiliency that can achieve high availability and rapid recovery alongside improved performance. The recent move by many to the public cloud is further accelerating this cloud-based resiliency approach. The benefits are potentially vast. But there are also risks and limitations created by the complex software and coordination of new third-party services and technologies necessary to orchestrate the applications and data.